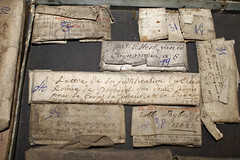 On Tuesday 11 January 2011, type was cast directly from the matrices made by Claude Garamont for his Gros Canon Romain and from Hendrik van den Keere’s matrices for his Moyen Canon Romain at the Museum Plantin-Moretus in Antwerp. 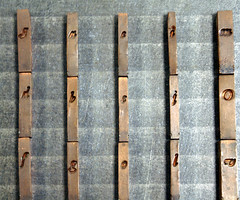 The purpose of the casting was to test whether the standardization of letter-widths measured in historic foundry type, which seem to prove Frank E. Blokland’s theories about the standardization, regularization, and unitization of Renaissance type, could also be traced back to the original matrices. The casting was done by Guy Hutsebaut of the Museum Plantin-Moretus. 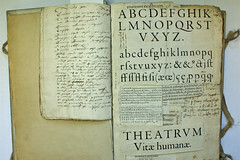 Because there were no moulds available which support the body sizes of the Gros Canon Romain and Moyen Canon Romain, the letters were cast on a body which did not exactly ﬁt. 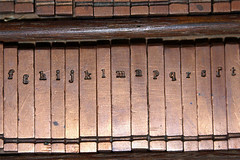 For testing the (standardization of the) width of the letters, the used 19th century mould was perfectly suitable though. In the movie Guy Hutsebaut shows the adjustment of the mould’s register using a single set pattern (the o) for a whole group of matrices. 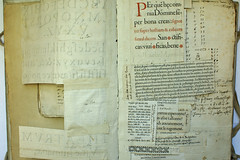 The set patern came from original sixteenth century foundry type of the Gros Canon Romain from the inventory of the Museum Plantin Moretus. After the ﬁnal adjustment of the register (using a small hammer) Guy checked the width of the newly cast letter against the original French Renaissance one. After approving the width, Guy cast several other letters from the same group, which –as expected– did not need additional adjustments of their widths. Although apparently less reﬁned than the ones from Garamont, the matrices which Van den Keere made with shortened ascenders and descenders could be applied in the same way, i.e. without any adjustments of the register (see image below). Hence the title of this movie: Standardized Casting. The background music is the Est-ce Mars by Jan Pieterszoon Sweelinck (1562–1621), a recording made in 2004 at the Pieterskerk (St. Peters Church) in Leyden on the famous Van Hagerbeer organ from 1643, as part of the DTL Type & Music Project. The organ player is the internationally laureled Leo van Doeselaar. Sweelinck lived in the same time as Van den Keere (ca. 1540–1580) and Christopher Plantin (1520–1589). This entry was posted in 5. Research, 5.2 Empirical testing. Bookmark the permalink.